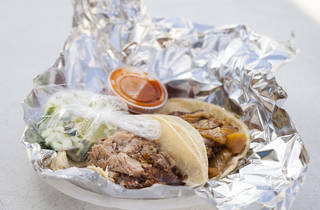 This carnitas truck is all about the meat. 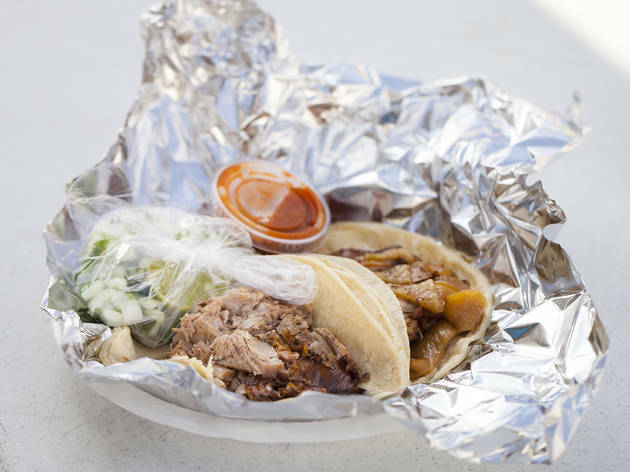 The carnitas tacos boast heaping portions of tender, juicy braised pork (obliterating the thin tortillas underneath, which are simply a delivery method). You can order your favorite cut, or try the extra saturated pork scraps on the bottom of the pan (migajas), or go for the popular “aporkalypse” surtido taco with a mix of shoulder, stomach, belly and skin ($2). This is the spot to pig out on pig. Find the truck during the day in their Boyle Heights location on Thursdays and Fridays and in other locations throughout the week. But don’t stop by too late as the small family operation can run out of several options before closing time due to high demand. I thought I know tacos, but the pork carnitas tacos at Carnitas El Momo opened up a whole new world of deliciousness to me. I tried both the lean and fatty cuts and ultimately loved the lean one more. The meat is tender, juicy, and absolutely perfect.